Free download Ashampoo AntiSpy Latest Version. During Windows setup many of these settings are pre-configured and in many cases it remains unclear to what extent Windows 10 will send out usage data. Do you really want to allow Windows 10 to access your calendar, emails, your location and many other settings? With Ashampoo AntiSpy for Windows® 10, you decide! Access all of your settings with ease. 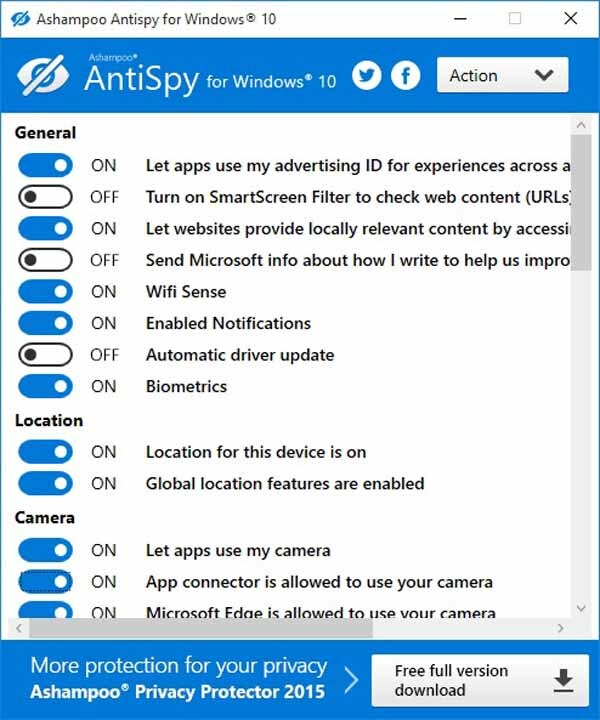 Ashampoo AntiSpy for Windows® 10 gives you an overview of all critical system settings and allows you to disable each one at the click of a button. Two included presets allow you to disable any reporting to Microsoft or rely on recommendations by our security experts. Windows 10 offers many comfort features such as the virtual assistant Cortana that can make everyday life easier for you. To make this possible, Windows 10 has to collect huge amounts of data. It also analyzes user profiles to display user-tailored ads as Microsoft openly acknowledges. So by default, Windows 10 is set to collect more data than many users would allow. Even the recommended express installation later states that: If you don’t want a particular setting you’ll have to disable it yourself.